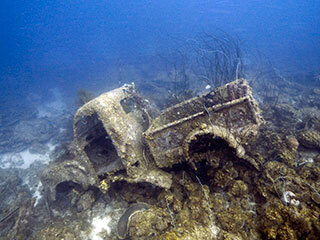 Vaersenbaai aka Kokomo Beach is the home of one of the two dive sites with historical car wrecks under water. In my opinion this site has nicer car wrecks than the other site at Marie Pampun although that site has also other objects than cars to look at. My buddy Rob, his friend Reinier and I decided to visit the car pile at Vaersenbaai. It was a long time ago and the sea was calm. 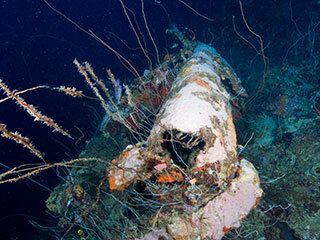 The latter is important because a long surface swim (20 - 25 minutes) is required to reach the location of the wrecks. This is not something you want to do when there are large waves. In the past there was a buoy to show the correct location but that buoy is long gone. Under water the large concrete block is still visible though. You need to go a few minutes past that concrete block. On May 4th and May 11th my dive buddy Rob and I wanted to go diving at Director's Bay. Unfortunately on both days there appeared to be no guard. Leaving the cars unprotected was something we didn't want to do so we went both times to Marie Pampun. Apart from a very easy entry into the water, a nice reef shallow as well as deep there is also the car pile. On May 4th we did our normal routine except that we went deep before we reached the small boat wreck. That is were we normally go from about 18 meters to about 30. This time by going deep before the boat wreck we reached the large trailer at 38 meters depth and went shallower from there. We saw that there were some other wrecks behind and deeper than the trailer so on May 11th we decided to go specifically for these wrecks. On October 30, 2011 the day has come that my buddy and I were able to celebrate his thousandth dive. It took some planning because on October 11 his dive counter showed 994 when he started a Search and Recovery specialty which would take 4 dives and he had 2 dives planned for a coral spawning study. I had to work. He completed his specialty but he decided to skip the second of the two coral spawning dives so the counter stopped at 999 on October 17. It took almost 2 weeks before we were able to plan the celebration dive together. We went to Porto Marie for this dive. For some time I had heard about a Seahorse at Vaersenbay but I was never able to take a closer look. This Saturday I went with a student for her third dive in the Open Water course. I knew exactly where the seahorse was located but it still took some time to actually see it. 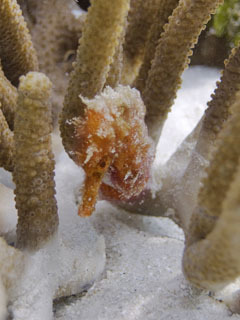 It is a small seahorse and it is attached to some soft coral but on the inside of a small bush. So it is not easily visible; I went back later that day with my camera and it took me quite some effort to take a good picture of it. The seahorse is in shallow water (about 10 feet) in front of the beach. In the neighborhood is also a kind of underwater oasis. The surroundings are all sand but there is a small stone base on the sand with a lot of coral on it. This oasis attracts a lot of fish. It is a perfect spot for snorkelers because is can be easily seen from the surface and it is within reach if you dare to dive down. 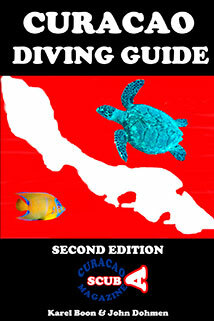 For divers it is a perfect spot to take a safety stop at the end of a dive. 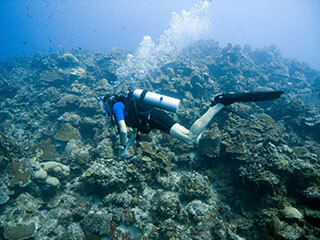 More pictures can be found in the Photography section under Pictures per dive site. When I found out that I was approaching my one thousandth dive I started planning to do that dive with my regular buddy, Rob. On Wednesday, June 8, 2011, the day had come. By doing a two-tank dive the second dive would be my one thousandth. So we left home rather early (8:30 AM) in the direction of Westpunt. That is one of my favorite dive spots at that side of the island of Curaçao. The characteristics under water are almost similar to Alice in Wonderland (Playa Kalki), it is safer to park your car there and the entry into the water is close to where you gear up.